Aloe ‘Booysen’ is a new species of Aloe and was grown in the Western Cape, South Africa, by Mr Kassie Booysen. This Aloe species was engineered by cross pollinating our indigenous variety Aloe dichotoma with Aloe barberae. 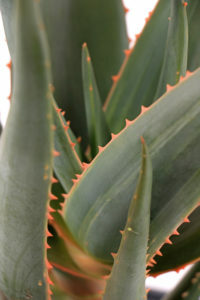 ‘Booysen’ is an extremely attractive Aloe featuring blue-green leaves which are edged in pink. Its thick short stem gives it even more character and shows its close relationship to Aloe dichotoma. Pinkish flowers appear in the late winter months and these are loved by birds, bees, butterflies and other insects. Aloe ‘Booysen’ can reach a height of approximately 5-7 metres. It grows faster than Aloe dichotoma (which is extremely slow) but not as fast as Aloe barberae, so it’s a good ‘half way mix’ in growing speed between the two varieties. This Aloe loves to grow in a well drained soil but will also tolerate slightly moist soils if required. Aloe ‘Booysen’ is water wise and drought tolerant. Beautiful Aloe ‘Booysen’ is a sculptural plant that is well suited to smaller gardens where it can be used as a focal point or as a specimen plant. It will make a spectacular statement in dry garden beds where it can be used to create height and contrast amongst other succulent types. This is a must have for gardeners and plant enthusiasts interested in something NEW and proudly South African.